In the last days of the Black Powder Wars, General Hiram Beauregard Trask, considered by many to be the bloody hand of the Guild, had an idea that would ultimately lead to his ruination and the destruction of hundreds of other lives. Only a young lad when he fled with his family through the First Breach prior to its closing, he still remembered the riches in soulstones and fantastic artifacts they had left behind. An avaricious man by nature, he spent his life dedicated to returning and claiming what was lost. A permanent breach presented too much of a risk of invasion, he thought, but a device that could make the journey on its own had potential for short-term raids that could make any man rich beyond the dreams of the age. And thus, the bloody seeds of the Spectral Line were planted in history. The Wars gave him access to the soulstones he would need to power such a device. His troops had a reputation as looters and pillagers more akin to pirates and privateers than actual soldiers. His lieutenants were terrors, each infamous in their own right, granted a weapon imbued with potent magic that made them nearly unstoppable and terrible to behold on the battlefield. His forces devastated enemy civilian populations, leaving their armies to watch helplessly behind the walls of their fortifications while their farms, cities, and homes were looted and burned. And all the while, the plan smoldered away in General Trask’s brain. As the war was entering its final days, Trask’s engineers reported to him that, at long last, the device was nearing completion. Dozens of Guild Mages spent their best years exhausting their magical prowess and in many cases their lives in the construction of a locomotive capable of crossing the space between worlds. 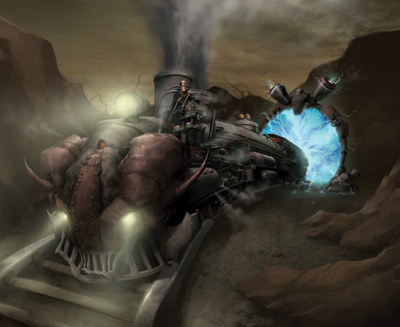 It was a fearsome steel and black-sooted monstrosity, towering over mundane trains and eerily lit from within by the pale green and white light shed by its soulstone engines. But you can only deny the Guild their share of the spoils for so long before they come to collect. When their ledgers finally started to come up light, three agents were sent to Trask’s army to settle accounts. His lieutenants took it upon themselves to send payment back to the Guild personally, in the form of the agents’ heads packed in a shipping crate. The army was then dispatched to bring in Trask, leading to a clash near Trask's personal fortification near Roanoke, VA that left both sides bloody. Knowing that time was running out, Trask loaded his arcane monstrosity with all of his ill-gotten gains and activated the device, ignoring the pleas of his engineers to wait until further testing could be completed. Guild cavalrymen chased the locomotive as it sped away from the factory, peppering it with futile gunfire before the massive train vanished with a terrific crack and flash of light. It's said that half the men who looked through the hole ripped between the worlds were driven instantly mad from the terrors they saw through the breach, and many more were struck permanently blind. The last anyone heard of Trask was his mocking laughter as he leaned out the window of the locomotive, waving his hat in a mock salute, followed for a split second by the horrified, agonized screams of every soul trapped in that steel prison when it rocketed into the aether. None of them were ever seen again. What happened to Trask and his cache of plundered soulstones is the subject of much speculation and legend among the folk of Malifaux, today. Any attempts to recreate the Locomotive have failed, as the notes left behind by the engineers seem to be no more than the ramblings of madmen, so most sane folk who know the particulars of the story assume that the device simply exploded and destroyed everything onboard. The Guild is more than happy to accept this explanation, and Trask’s expedition is considered to be officially lost with all hands in the space between worlds. Expeditions to search for it are flatly discouraged. However, Travelers in the Badlands have repeatedly told tales of hearing the haunting sound of a ghostly train whistle echoing in the night despite being miles away from the closest railroad tracks. Rumors abound that one or more of the Lieutenants’ weapons have been recovered and used in scraps in and around Malifaux proper. The engines in the locomotive used up soulstones by the barrel when running at full burn, and Trask’s logs recorded his supply train as carrying enough fuel for three round-trips. Anyone who could find it would be instantly rich beyond his or her wildest imaginings, so expeditions still form from to seek the legendary Spectral Line in the wilderness. For the time being, however, none of them have found anything besides dust and frustration. It seems likely, however, that one way or another this horde of soulstones will be found if it still exists. The only question is how many more souls will be ground beneath the wheels of Trask’s locomotive, first.